Passion Pit is an electronic band which formed in Cambridge, Massachusetts, United States in 2007. Passion Pit’s first proper full-length, Manners, a bird-flipping break from the blogosphere by a 21 year old with much more on his manic mind than girls, girls, girls. You know, important matters, like the end of the world and learning to love someone other than the man in the mirror. That’s the thing people missed about Passion Pit’s debut EP, Chunk of Change. While it was originally meant as a Valentine’s Day gift for a girlfriend who “put up with” frontman Michael Angelakos, that detail’s only half of a story that isn’t so cuddly when you consider the circumstances. You see, Angelakos has written songs since he was a piano-pounding 5 year old, from spooky and spare folk tunes to pit-stirring ska punk. But one day, he just stopped. Not by choice. Angelakos’ creative well was simply in need of a severe refill, so he started toying with the plug-ins and infinite possibilities of a computer program. Six tracks later, Chunk of Change was born by default. In need of an impromptu thank you card and some feedback from friends, Angelakos started spreading the songs around—quite casually, really. Which is impossible to do in an era when blogs are as obsessed with breaking the Next Big Thing as labels are. Flash forward to 2008. With Chunk of Change’s official unmixed/mastered pressing in tow, Angelakos and the ever-evolving Passion Pit band play to a sold-out crowd at New York’s Bowery Ballroom. A crowd that sees nothing wrong with singing along to every word; even several Manners selections, learned via osmosis by the second verse. With flash bulbs popping in his face like the frontline of a rifle-toting army, Angelakos notes the bizarre scene in front of him but never loses sight of why he’s here, of his calling to craft pitch-perfect pop songs—hooks that nip at your heels and choruses that burrow into your brain. irresistible, filler-free glimpse into the mind of a man who’d like to unleash his very own Pet Sounds someday. Check the carefully-sculpted songwriting on display: the speaker-panning synths and slightly sinister children’s chorus (straight outta P.S. 22 in NYC) of “Little Secrets” and “The Reeling,” the lead dulcimer loops and melancholic melodies of “Moth’s Wings,” the ecstatic, riled-up climax of “Folds in Your Hands.” All part of a greater plan, the next step of which is taking Passion Pit’s live show to a level that matches, and eventually exceeds, Manners’ ambition and kaleidoscopic soundscapes. Because when Angelakos says he wants to be the next Randy Newman, he’s dead serious. And when he adds that Passion Pit is “a band with a lead songwriter, not just Michael Angelakos and these guys,” it’s clear he’s just getting started. In an August 2010 interview with NME, Angelakos stated that work had already begun on the follow-up to Manners and that the band intended to release the album in the spring of 2011. He has since said that it will be released early in 2012, and finally that the release date will be July 24th. On April 24th, 2012, Angelakos announced the title of the album, Gossamer, and that it will be released on July 24th, 2012. On May 7th, the first track from Gossamer was released, called "Take A Walk". On June 12th, the second track from "Gossamer" was released, called "I'll Be Alright." The tracked leaked early on June 11th and was released as an NME premiere on June 8. 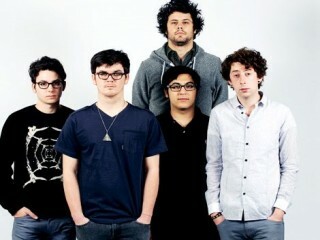 View the full website biography of Passion Pit.